This is the third part of a three-part article about ADA-compliant hand dryers. Title III of the ADA prevents discrimination based on disability in the full enjoyment of goods, services or facilities of any place of public accommodation. That includes most places of lodging, recreation, transportation, education and dining, along with stores, care providers, and places of public displays. Although the legislation is expansive, there are exclusions to its reach. Title III does not include many private clubs and religious organizations. Historical buildings are often exempt from having to make architectural changes. And while all new construction must fully comply with ADA, some existing facilities may only need to remove architectural barriers that are easily accomplished without much difficulty or expense. The rules can be complicated even for trained architects to understand. Distributors in need of help should ask their hand dryer vendors if they provide any education for creating specifications for new or renovated restrooms. When in doubt, however, facilities should err toward ADA compliance. More often than not, facilities must have ADA-compliant dryers or traditional units that are recessed. There are still many restrooms in violation of the law, however, because it’s not always a top-of-mind issue for managers who are overworked and underfunded. Investing in ADA-compliant hand dryers makes sense for new construction, during a total renovation or when replacing an end-of-life machine. 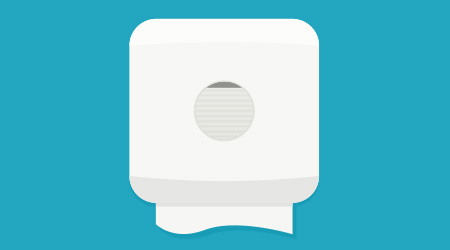 The machines are also popular among facilities switching from paper towel dispensers to dryers. Facilities that have not yet made the switch to ADA-compliant hand dryers have alternatives. Traditional units can be recessed into the wall, but the retrofit kits and labor costs for installation can quickly add up. Another, less-expensive option is to install an ADA wall guard below existing full-size dryers to meet compliance regulations. Whether updating an existing restroom or outfitting a brand-new one, it’s important to consider the ADA in all aspects of the design, including the simplest fixtures. Selecting compliant hand dryers not only keeps the facility in compliance with the law, but it also ensures the satisfaction of every customer, regardless of ability.